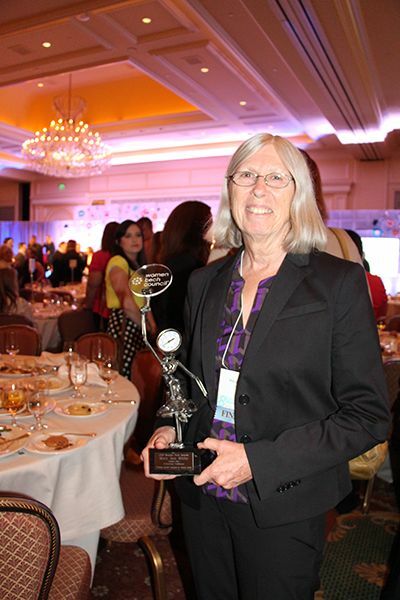 Mary Ann White poses proudly with her Technology Trailblazer Award at the Women in Technology 2015 awards ceremony. Aerospace Structures Division Materials and Process Chief Engineer, Mary Ann White and Propulsion Systems Division Materials and Process Design Sr. Manager, Kathy Allman were top finalists at the distinguished Women Tech Awards on September 22 when the Women Tech Council held their 8th annual Women Tech Awards at the Grand America Hotel in Salt Lake City. White and Allman were among 16 finalists honored, each exemplifying excellence in their tech-related fields. The 16 finalists of the Women Tech Awards are CEOs, founders, managers and engineers from companies such as Adobe, Orbital ATK, Domo and eBay. The ceremony also honored a current student making strides in the industry as part of the 2015 Student Development Award, selected from three finalists from Utah Valley University, University of Utah and Brigham Young University. Seven finalists were selected to receive top awards. Orbital ATK’s Mary Ann White was awarded with the Technology Trailblazer award. White thanked those who have supported her career, including the Orbital ATK team she credited with providing her challenging opportuni­ties that have made her a better engineer. The Women Tech Awards were initiated in 2008 to recognize women in technology fields who are driving innovation and contributing to the community. Orbital ATK women have been named as finalists and have captured top awards in each of the past eight years. The Women Tech Council is dedicated to the professional development of women in technology and inspiring young women to enter the challenging and rewarding technology professions. Kathy Allman considers her greatest achievement to be a healthy work-life balance. Kathy raised two daughters (both military veterans), earned a fourth degree black belt, and actively participates in the community as a martial arts instructor and role model, with passion for empowering women to pursue their dreams. Kathy began her career as a paralegal where she was elected president of the Utah chapter of the legal assistants association. Her legal work in support of medical and engineering issues piqued an interest in technical disciplines. Kathy pursued that passion and earned a B.S. in Mechanical Engineering while working full time. Kathy joined Orbital ATK in 2007 as a Mission Assurance specialist assigned to the live propellant Mix and Cast operations center. Kathy quickly established herself as a top technical contributor and innovation leader, earning several industry and NASA awards. During this time period Kathy earned her M.S. in Mechanical Engineering and graduate certificate in Systems Engineering. Orbital ATK selected Kathy to pioneer the Value Stream Engineering Team responsible for rocket motor case insulation. The VSET is accountable to deliver a product meeting all requirements via seamless integration and concurrent engineering. Kathy’s energy, expertise, and technical leadership were key to defining and maturing this approach and capturing effective standard processes shared across the business. Kathy currently manages Materials & Process. Tasked with redefining this capability in the company, she has been aggressively defining waste reduction processes, negotiating commonality wins across varied programs, developing top notch engineers, and successfully implementing game changing improvements. With a reputation for integrity in her work, Kathy was recently recruited to chair the Orbital ATK ethics committee. From 2012 through 2014, Mary Ann White served as the President of the Salt Lake American Chemical Society Section. She also supports the University of Utah through educational presentations, helping the students better understand the career opportunities available chemists, and serving as a role model to women chemists. Mary Ann White was drawn to a career in chemistry at a young age due to the influence of an outstanding high school chemistry teacher. As a result of this influence, she earned her B.S. in Chemistry from Miami University, graduating with Phi Beta Kappa and Sigma Xi honors. Mary Ann went on to earn her PhD in Chemistry from the California Institute of Technology. While at Caltech, she published technical papers and obtained patents on transition metal organometallic chemistry. Mary Ann began her working career with General Electric in their corporate Research & Development organization. She developed silicone sealant formulations that were patented and commercialized, and received GE’s CRD Dushman Award for outstanding technical accomplishment. Subsequently, Mary Ann worked for Chevron Research Company, where she excelled and developed patented olefin oligomerization processes and products. 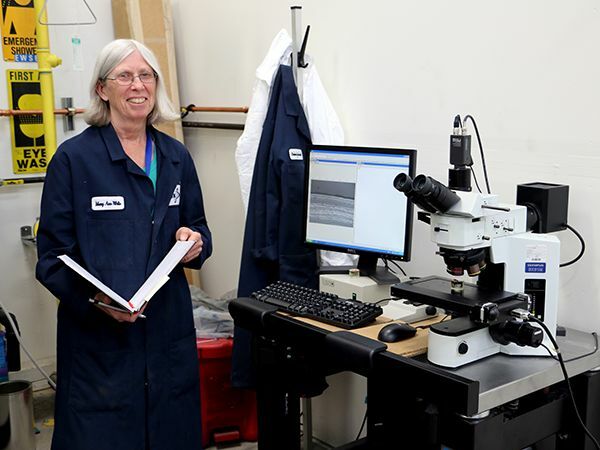 Mary Ann’s career at Orbital ATK started with the then-Hercules Composite Products Division in Magna, Utah, where she developed new matrix resin systems for carbon fiber composites. 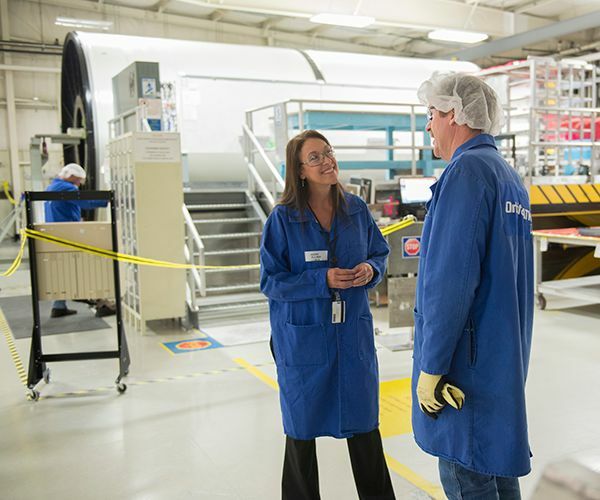 She eventually joined the Science & Technology department at the ATK Bacchus Works, before joining the ATK Aerospace Structures Division in Clearfield, Utah. In her current role as a Materials and Process Chief Engineer, Mary Ann supports all of the Division’s programs including rocket motor cases, large launch structures and military and commercial aircraft programs, and serves as a mentor to many younger scientists and engineers across Orbital ATK.